TAG Farnborough Airport recently commissioned Design Inc print design services for the creation of their new flagship brochure. Our briefing included at its heart the need for compelling representation of the truly inspirational architecture and unique passenger and operator ‘experience’ that awaits private aviation travellers and crew when using TAG Farnborough Airport. An award-winning airport entirely dedicated to private aviation. Print design services rank among the main integrated disciplines provided by Design Inc. Effective campaigns can often include a printed element as an illustration of a point of difference or means for a client to best demonstrate a special or unique quality of a product or service. The visual aesthetics, design, quality of materials, air of calm and levels of service provided by TAG Farnborough Airport provided a range of design cues for our print design services to follow as inspiration. 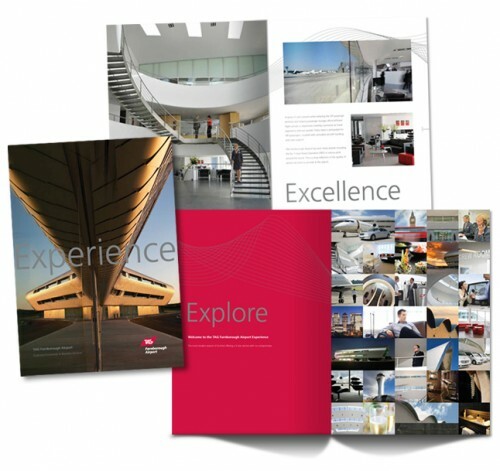 The resulting brochure format and production specification that resulted from Design Inc print design services marries the TAG Farnborough Airport brand elements with a lifestyle feel that brings warmth to the cool Swiss feel and minimalist building interiors. A true temple to aviation and design for air travel deserves nothing less. The cover features a striking image of the terminal building with a reflection of itself which mirrors the impression of the fuselage and tail of a jet aircraft teamed simply with the aspirational word ‘experience”. The brochure has been very well received both by the team at TAG Farnborough Airport and beyond. The creative approach to the print design services is now being developed into a very special TAG Farnborough Airport 2012 bespoke desktop calendar innovatively contained within a branded engraved metal case. Design Inc UK is a West London-based specialist in print design services. If you’re considering our print design services for any new marketing communications, please contact us by calling 01784 410380 or emailing us to find out more.